With thousands of unconfirmed Ebola deaths the government of Sierra Leone is covering up and its continuing ignoble policy of under-reporting new cases, the long awaited British military ship – RFA Argus arrived today in Freetown, carrying aid, supplies and off-road vehicles to take the fight to Ebola. This latest contingent of British support for the people of Sierra Leone is bound to bring much psychological relief to millions of Sierra Leoneans. The war on Ebola has just began. 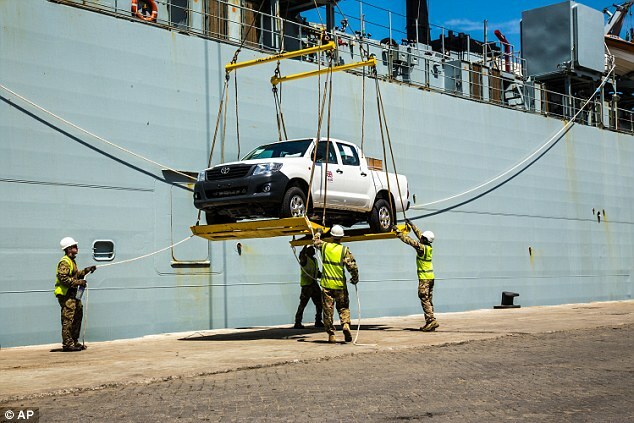 The warship – one of Britain’s largest, arrived in Freetown this morning and immediately began offloading 32 off-road Toyota vehicles, bought by DFID to help close the massive logistics deficit, in the war against Ebola. 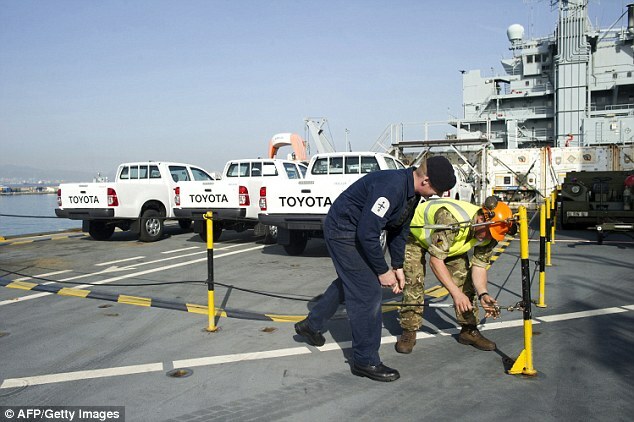 The British ministry of defence says that the warship will play a vital logistical role in support of the government of Sierra Leone and DfID, and the military personnel based in the country. British Defence Secretary – Michael Fallon said: “I am immensely proud of the commitment our troops – both regular and reserve, are playing in delivering Britain’s response to the Ebola outbreak in Sierra Leone. The British ministry of defence says that, three Merlin Mk2 helicopters from 820 Naval Air Squadron, will be used to help British Army medical teams and aid experts, move quickly around the country in their race to help tackle the Ebola Virus. Two landing craft vehicles and three rigid hull inflatable boats from 539 Assault Squadron Royal Marines will be used for moving equipment and personnel inland, along Sierra Leone’s river network. The arrival of British warship – Argus, is the latest deployment in a joint defence operation to assist the UK aid mission, with around 800 deployed personnel involved in total. RAF personnel are based at Accra in Ghana – supporting the movement of equipment and personnel, and in Sierra Leone as part of the joint command team which is supporting the international aid effort. Personnel from 5 Medical Regiment, are helping to train more than 800 local healthcare workers at the Ebola Training Academy. Those healthcare workers will work in community care treatment centres across the country. British military engineers have overseen the construction of 5 treatment units, which will provide 700 beds and become available for use by the end of November. In addition, the Kerry Town Treatment Centre in Freetown is scheduled to open for patients in the next few days. Part of this facility will be manned by medics from 22 Field Hospital, Royal Army Medical Corps, and will provide care to healthcare workers. 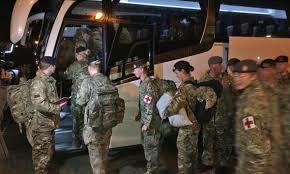 More than 20 British Army reservists have this week been called up to help run the Kerry Town Treatment Centre for healthcare workers. The reservists – medical professionals, who have all volunteered specifically for the Ebola operation – will deploy in December. Based on the rate of transmission and the projected rise in new cases in the coming months, the Sierra Leone Telegraph estimates that more than 3,000 beds would be needed to cope with the treatment of confirmed cases and quarantining of suspected cases across the country. WHO have estimated the absolute minimum numbers of international workers needed as follows: Facility management teams – over 100 people; International clinical staff – over 600 immediately and more as teams rotate out. 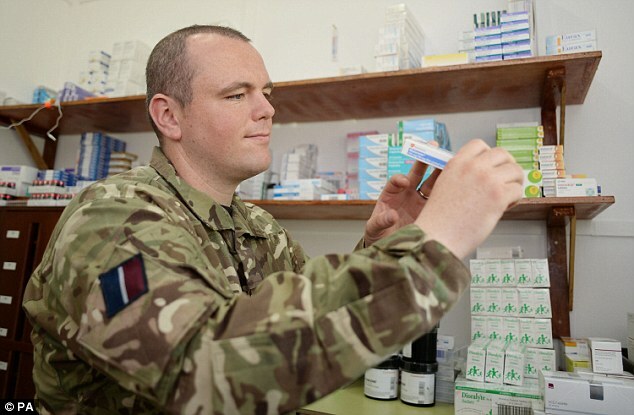 This includes doctors, nurses, nurse aids, pharmacologists, pharmacists and logistics support. And Management support for over 2,500 local clinical staff. On paper, there is little doubt the arrival of this massive British support, meets the requirement of WHO. But cutting through the current somewhat chaotic environment, in an orderly and organised manner is now the challenge. Early this month, a spokesman for the British Prime Minister David Cameron said that British government support for Sierra Leone; “will provide help for up to nearly 8,800 patients over a 6 month period. The UK will provide infection training for workers and support to ensure safe burials. Two flights containing ambulances, tents and further UK aid to tackle the Ebola outbreak in Sierra Leone arrived in Freetown last month. 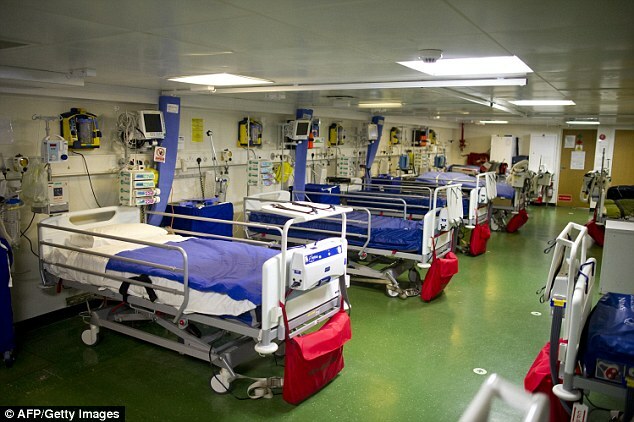 (Photo below: Inside the RFA Argus). The flights delivered equipment to assist with the construction and operation of the UK’s 92 bed treatment facility, including generators, air conditioning units and lighting sets. And a further 120 military medical staff are already deployed in the country to take the fight to Ebola. Announcing the unprecedented humanitarian help the British government is sending to Sierra Leone, early this month the Defence Secretary said: “we are stepping up significantly the UK’s contribution and leadership in work to tackle the outbreak on land, in the air and at sea. “At the heart of the package is the commitment to provide more than 750 personnel to help with the establishment of Ebola treatment centres and an Ebola training academy. “We are deploying troops, helicopters and a ship – army medics and Merlin helicopters supported by RFA Argus – to provide direct support and reassurance. “Support for a World Health Organisation-led Ebola training facility to assist in the training of healthcare workers, logisticians and hygienists who are needed to staff treatment units; this support includes the provision of over 200 military staff to run the site. 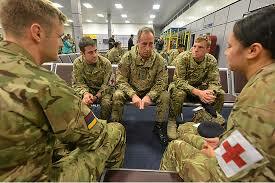 No one is doubting the British capability and capacity to defeat Ebola in Sierra Leone. 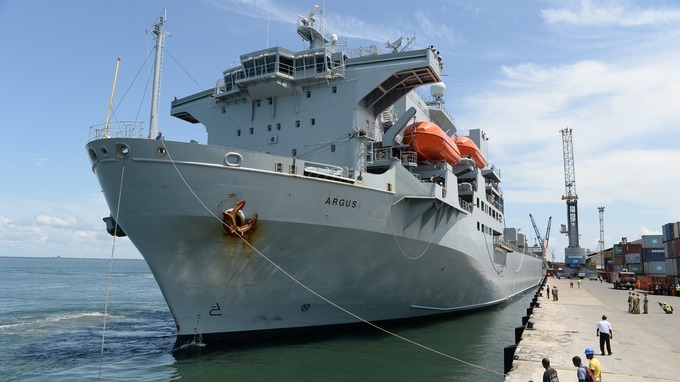 RFA Argus has arrived in Freetown today – now the war on Ebola begins.